What if a drug was invented that would reduce the risk of cancer to almost nothing? What if the same drug was just as effective against heart disease? What if this drug also greatly reduced the risk of diabetes, asthma, birth defects, Alzheimer’s, depression, mental illness, ADD, arthritis, obesity, indigestion and every other chronic disease that plagues humankind? What if this very same drug strengthened your immune system to the point that the flu, colds, and infections became a thing of the past? What if the side effects of this drug were limited to a feeling of well-being, boundless energy, peaceful sleep, enhanced mental and physical ability? Wouldn’t you take this drug? There is no such drug. But you can learn to do something that can provide all of the benefits I have described. You can learn to cook. The human body is far more complex and intricate than anything invented by human science. There is much about the workings of the human body that is still a mystery. But we do know that the human body has an amazing capacity to protect itself, heal, regenerate, and rebuild. We also know that the body can fail, become very ill, and die. What is the difference between a healthy body and a sick one? Dr. Weston A Price, a dentist, noticed that each generation of his patients was less healthy than their parents. He decided to study the effect of diet on humanity, travelling to many countries to learn what healthy people ate. Dr. Price found that people eating the diet of their ancestors were healthy, with none of the chronic diseases that are so common today. These people did not have heart disease. They did not have cancer. They did not have mental illness. They did not have crime. They had no tooth decay, although they had no dentists. When the same people ate modern foods, their teeth decayed, and they suffered from all the chronic illnesses that afflict us today. When the human body gets all the nutrients it needs, it is healthy. When the body does not get those nutrients, it is sick. Modern foods do not provide all the nutrients needed for good health. Supplements are not the answer, because the body takes its nutrients from foods, including a number of substances in the whole food called cofactors, which are often unknown, and are needed by the body to assimilate nutrients. Supplements do not have all the cofactors. The only way to get all needed nutrients is to eat real, unaltered food, prepared by somebody who knows how to cook it. The most important task any of us can learn is to cook real food, as this is the only way we can provide the nutrients necessary for health. Learning what to eat and how to cook takes time and work, but the rewards are worth it. To me, cooking has become more art than work. I truly enjoy it. When I cook, I am always aware that the food I am cooking will become part of me and the people I care about. I cultivate a happy, loving contentment when I cook — knowing that what I am doing will make me and my family healthier, while giving us the pleasure of a delicious meal. I cannot describe how good it feels to become healthier, and to see your family become healthier, and to know it is because of the good food you prepare. Real cooking may seem difficult at first, but it gets easier and faster over time. If you cook enough, it will become as easy and instinctive as riding a bicycle, or driving a car. I believe that food must taste good to be truly nutritious. The good taste and smell of real food, properly prepared, gives much pleasure while stimulating the salivary glands. The salivary glands produce substances that aid greatly in the digestion and absorption of food. Good taste helps good nutrition. Dr. Price discovered what to eat, and what to avoid. I follow the Weston A. Price Foundation’s Dietary Guidelines. 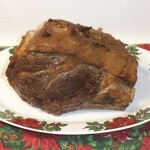 I have switched entirely to grassfed and grass finished meat, with wonderful results. If you have decided to learn to cook real food — the most important task — I recommend the book Nourishing Traditions: The Cookbook that Challenges Politically Correct Nutrition and the Diet Dictocrats by Sally Fallon and Mary G. Enig, PhD. This magnificent book covers just about every aspect of cooking real food, while providing a huge amount of information on what to eat and why. While the scope of the book may seem overwhelming, you don’t have to read the whole thing at once. I recommend using the book as a cooking encyclopedia, and looking up the specific issue or recipe you want to learn about. 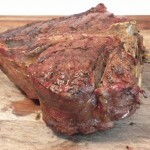 For a detailed and user-friendly cookbook on grassfed meat, designed for people who have never cooked grassfed meat, I recommend Tender Grassfed Meat. That is why I wrote it. This post is part of the Real Food Wednesday blog carnival, hosted this week by Cheeseslave blog. Go see other homages to real foods, good fats on Cheeseslave.com!